Summary: A new compound prevents cognitive decline associated with chemotherapy treatments in rats, a new study reports. Findings offered by a University of Kansas researcher, identified as one of 20 ‘Must See Presenters’ at the national meeting of the American Chemical Society in early April, suggest a possible therapeutic intervention for “chemobrain,” the cognitive impairment plaguing up to a third of cancer patients following chemotherapy. This is an executive summary of findings by a team headed by Michael Johnson of the University of Kansas. NeuroscienceNews.com image is credited to KU News Service. Funding: The American Cancer Society supported this work through an institutional grant to the KU Cancer Center. The research was also supported by the KU Center for Molecular Analysis of Disease Pathways, the National Institutes of Health and KU. 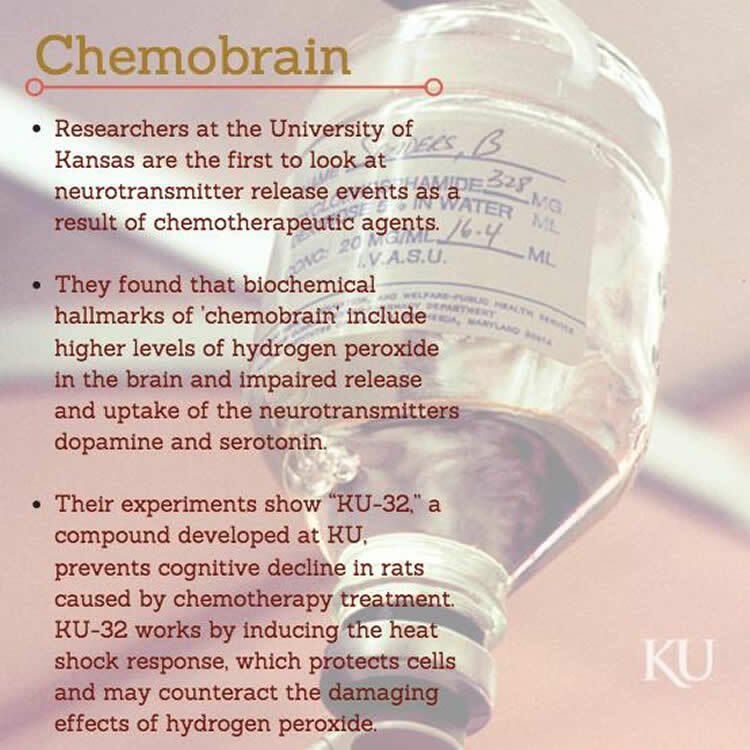 Image Source: NeuroscienceNews.com image is credited to KU News Service. University of Kansas “Potential Therapy to Prevent Chemobrain in Cancer Patients.” NeuroscienceNews. NeuroscienceNews, 12 April 2017. University of Kansas “Potential Therapy to Prevent Chemobrain in Cancer Patients.” http://neurosciencenews.com/chemobrain-cancer-6397/ (accessed April 12, 2017). Chemotherapy induced cognitive impairment (i.e. Chemobrain) involves acute and long-term deficits in memory, executive function, and processing speed. Animal studies investigating these cognitive deficits have had mixed results, potentially due to variability in the complexity of behavioral tasks across experiments. Further, common chemotherapy treatments such as 5-Fluorouracil (5-FU) break down myelin integrity corresponding to hippocampal neurodegenerative deficits and mitochondrial dysfunction. There is little evidence, however, of pharmacological treatments that may target mitochondrial dysfunction. Using a differential reinforcement of low rates (DRL) task combining spatial and temporal components, the current study evaluated the preventative effects of the pharmacological agent KU32 on the behavior of rats treated with 5-FU (5-FU + Saline vs. 5FU + KU32). DRL performance was analyzed the day after the first set of injections (D1), the day after the second set of injections (D7) and the last day of the experiment (D14). The 5FU + KU32 group earned significantly more reinforcers on the DRL task at D7 and D14 than the 5FU + Saline group. Further, the 5FU + KU32 group showed significantly better temporal discrimination. The 5FU + KU32 showed within-group improvement in temporal discrimination from D7 to D14. No significant differences were observed in spatial discrimination, however, those in the 5FU + Saline group responded more frequently on T3 compared to the 5FU + KU32 group, highlighting temporal discrimination differences between groups. The current data suggest that KU32 shows promise in the prevention of chemotherapy induced impairments in temporal discrimination.